Roxanne Pollard, a first-year technical apprentice with Gloucestershire-based Renishaw was chosen to represent the UK at the Intel International Science and Engineering Fair (ISEF) held in Los Angeles recently. She was one of six students representing the UK at the international awards. The award, which was presented at the Young Engineer for Britain National Final in London during the national Big Bang Fair, included an all-expenses paid week-long trip to ISEF. The Big Bang Fair was held during the National Science and Engineering Week. Ms Pollard won the award for her innovative Bicycle Safety Helmet designed to allow cyclists to indicate presence and driving directions while keeping full control of the bike. 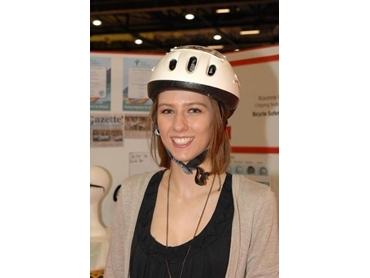 The helmet was originally developed as part of an A level Design & Technology course project by Ms Pollard whilst attending Chipping Sodbury School, near Bristol. Judged by a series of experienced engineers, Ms Pollard’s safety helmet project was awarded points for concept, process, product and person. The final decision was made by a team from the Worshipful Company of Scientific Instrument Makers who selected her as their nominated attendee at ISEF. Having joined the Renishaw apprenticeship scheme in September 2010, Ms Pollard is currently based at the Gloucester Training Group where she is studying mechanical and electrical engineering. Although she has three A-levels and one AS-level, she turned down university places to apply for an apprenticeship. Ms Pollard received her award from Brian Fishwick, Master of the Worshipful Company of Scientific Instrument Makers in the presence of TV personality and particle physicist Professor Brian Cox, and Kate Bellingham, President of Young Engineers. Operating in several countries, Renishaw offers a range of innovative products including probe systems, position encoders, medical devices and spectroscopy products. Renishaw Oceania represents the Renishaw group in Australia and New Zealand.